After rolling myself out of my parents’ house, I got hungry (again). I was craving veggies in a major way after days of carb-loading (sour cream & cream cheese mashed potatoes anyone), and needed to make something straight out of the pantry since I was without groceries. I looked in my bare cabinets, and pulled out a can of chickpeas. Eureka! I love creating multiple recipes with different flavor profiles from the same base ingredients. It’s a way for me to make left-overs exciting and new! Last time I shared my meatball recipes. Now I bring you Chickpeas 2 ways. Heat 1 tbs olive oil over medium heat. 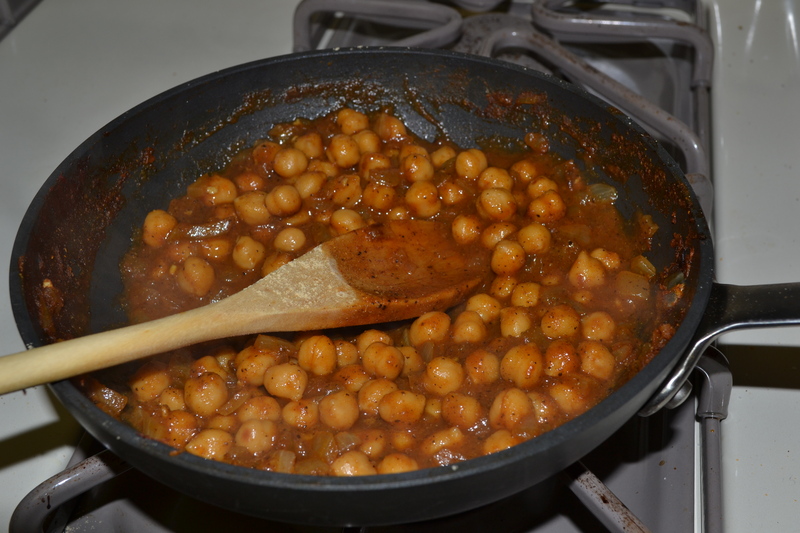 Add 1/2 a can of chickpeas and diced onions, then sprinkle with salt and pepper. Saute for 5 mins. Add tomato paste and 1/2 cup of chicken broth to pan. Add garam masala, curry powder and cumin to pan. 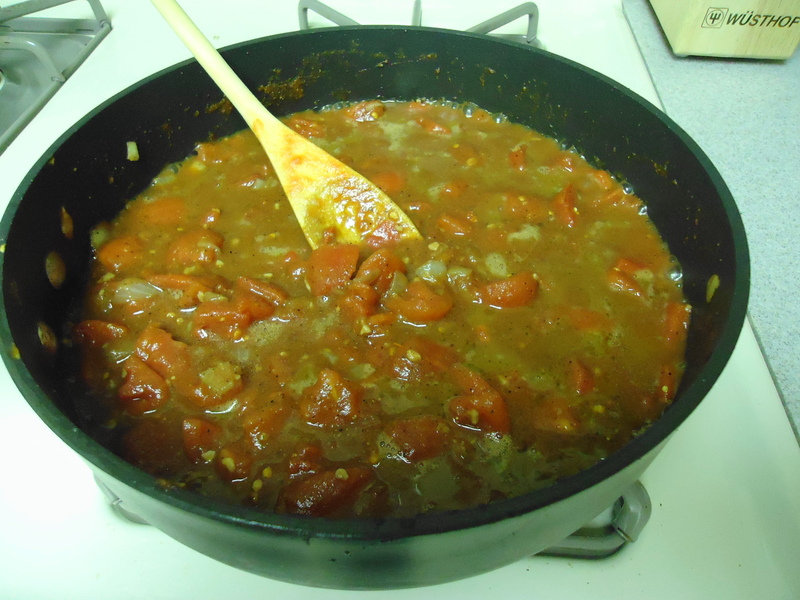 Stir, and continue to cook over medium heat until sauce thickens, about 7-10 mins. Add additional 1/2 cup of chicken stock and sprinkle ground ginger over top. Add salt and pepper to taste, and stir. Cook for about 5 more mins and take off the heat. 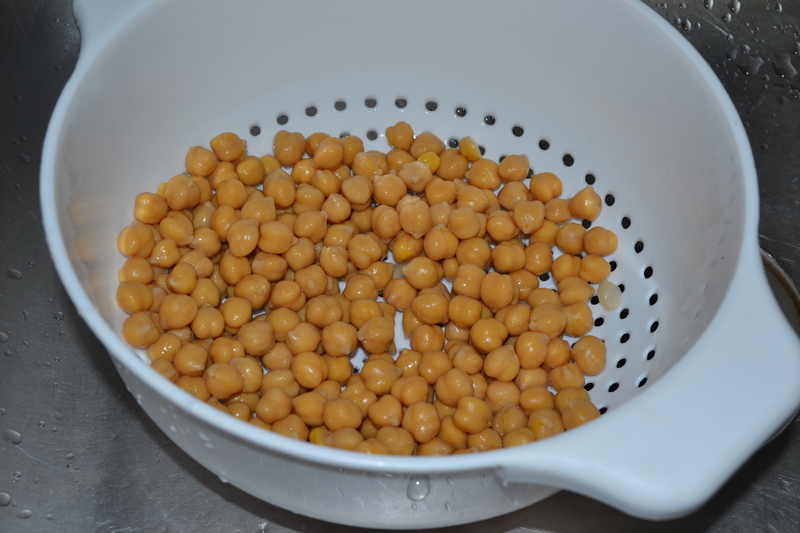 Your chickpeas should be soft, and will be perfect served over a bowl of brown rice! Heat 1 tbs olive oil over medium heat. 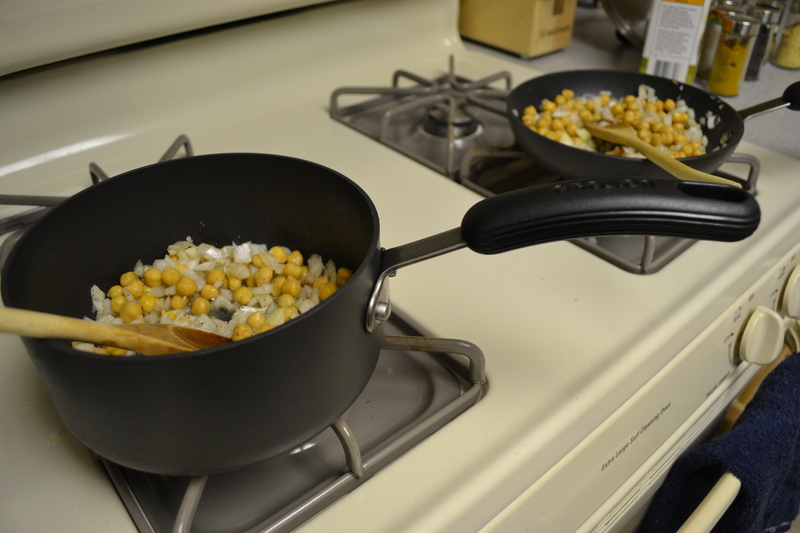 Add 1/2 can of chickpeas and diced onions , then season with salt and pepper. 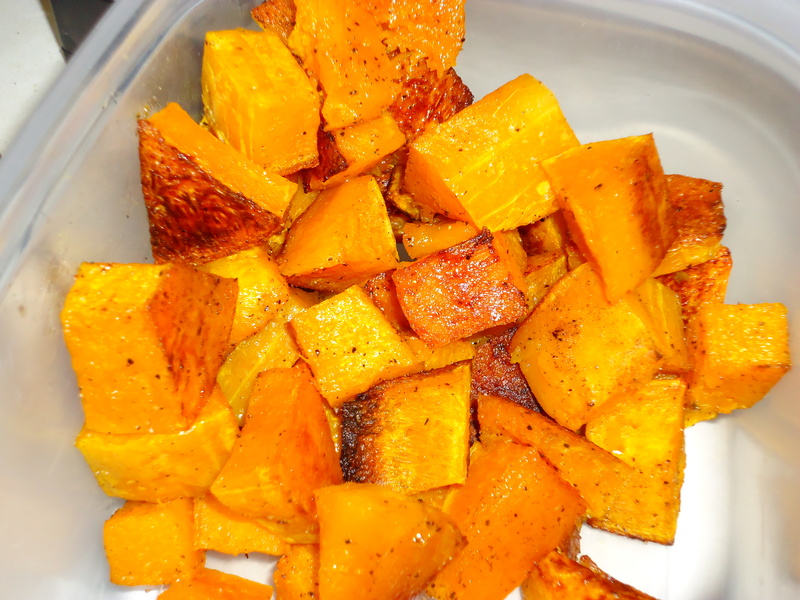 Saute for 5-7 mins. 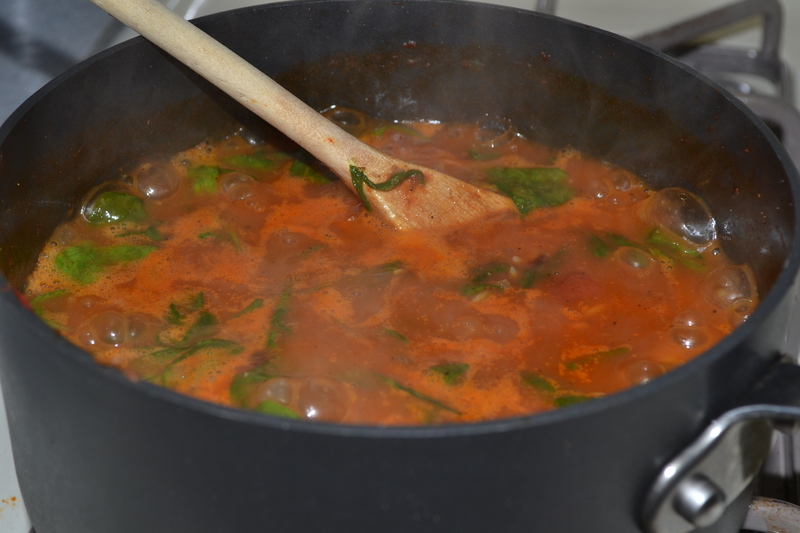 Add tomato paste, 1/2 cup of water, spinach and canned tomatoes to the pot. Continue to cook over medium heat until chickpeas are tender and spinach has wilted. About 7 mins. 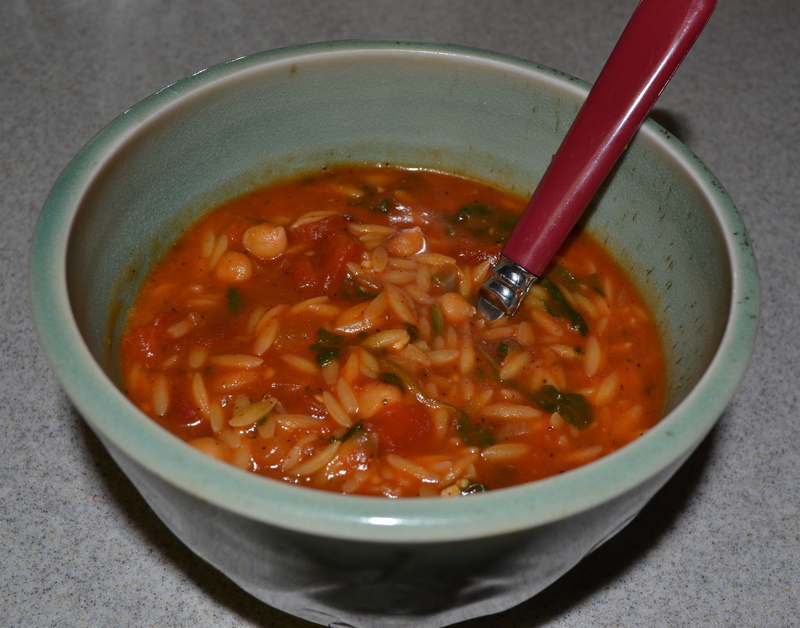 Add cup of chicken stock and orzo, then bring to a boil. Continue to cook at a boil until orzo is cooked, approximately 7 minutes, stir periodically or orzo will stick to the bottom of the pot. Add salt and pepper and stir. I love this stoup (Rachael Ray’s term for a cross between stew and soup), because it’s hearty and healthy after days of indulgence! Plus I found a way to make 3 meals out of ingredients in my apartment. You can re-create this meal for a few bucks at the store. Yay for cheap/free food! 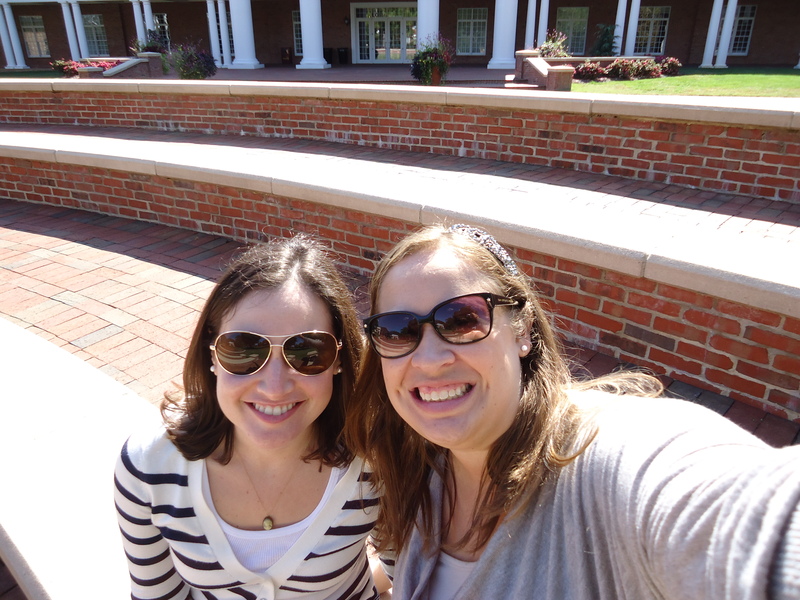 I spent this weekend hanging out with my best friend Rach in North Carolina for Elon University’s Homecoming. As we feared, the Phoenix lost the game. Thank goodness we were smart enough to bag the game, walk around campus (read the tailgates), and eat delicious food (read fried food). I came home and was craving some veggies for dinner. 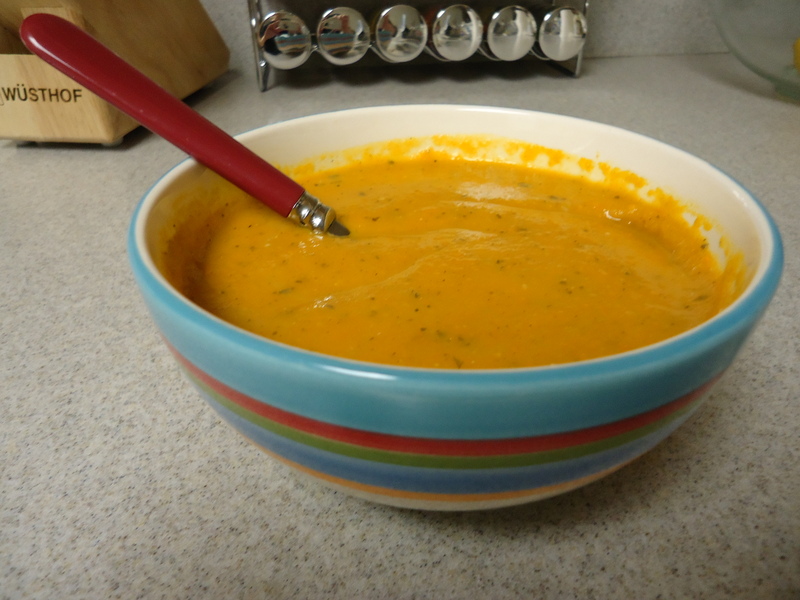 I stared at the frozen remains of my Roasted Squash and Carrot Soup looking for inspiration and had a food epiphany! I quickly headed to the store for my final attempt to use up my soup. The first thing I did was to nuke my frozen soup in the microwave, and you could also heat it up in a pot on your stove top. Next I mixed the ricotta cheese with the rosemary and egg. 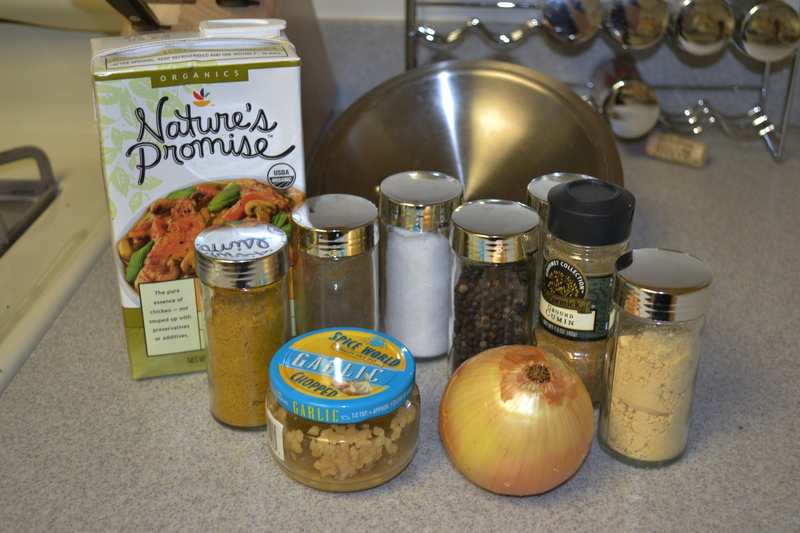 I added salt, pepper, and a sprinkle of garam masala to bring out the flavors of the soup, and put this mixture back into my fridge. 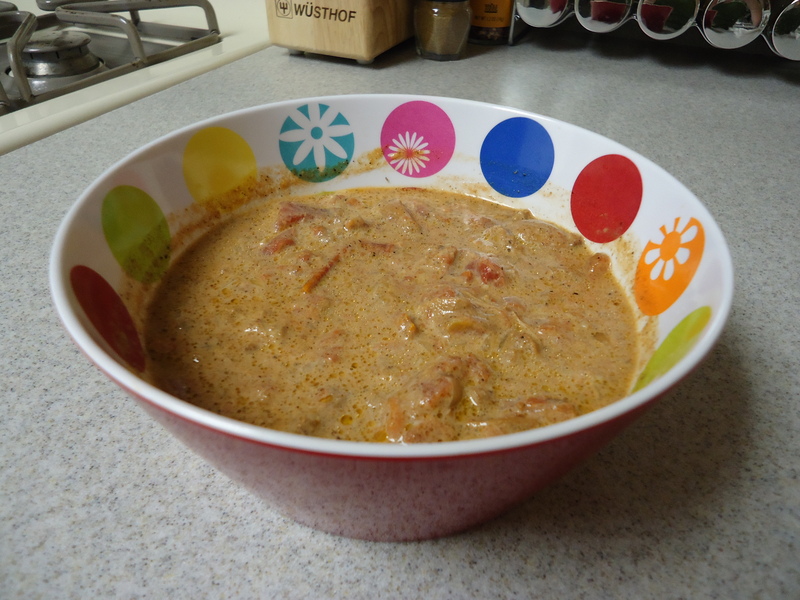 Afterwards I started on my bechamel sauce, which I thought would help to cut back on the sweetness of the soup. In a medium saucepan, heat the butter over medium-low heat until melted. Add the flour and stir until smooth. 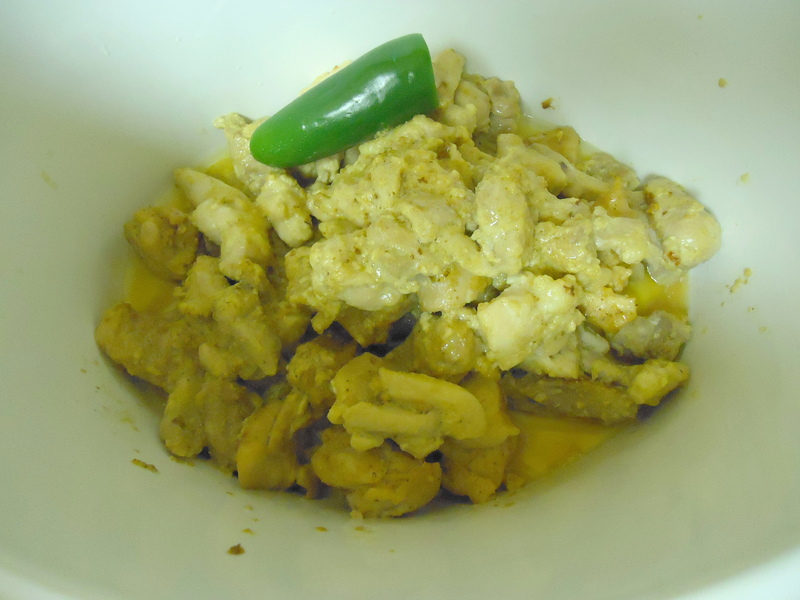 Over medium heat, cook until the mixture turns a light, golden sandy color, about 6 to 7 minutes. Meanwhile, heat the milk in a separate pan until just about to boil. Add the hot milk to the butter mixture 1 cup at a time, whisking continuously until very smooth. Bring to a boil. Cook 10 minutes, stirring constantly, then remove from heat. Season with salt and nutmeg, and set aside until ready to use. 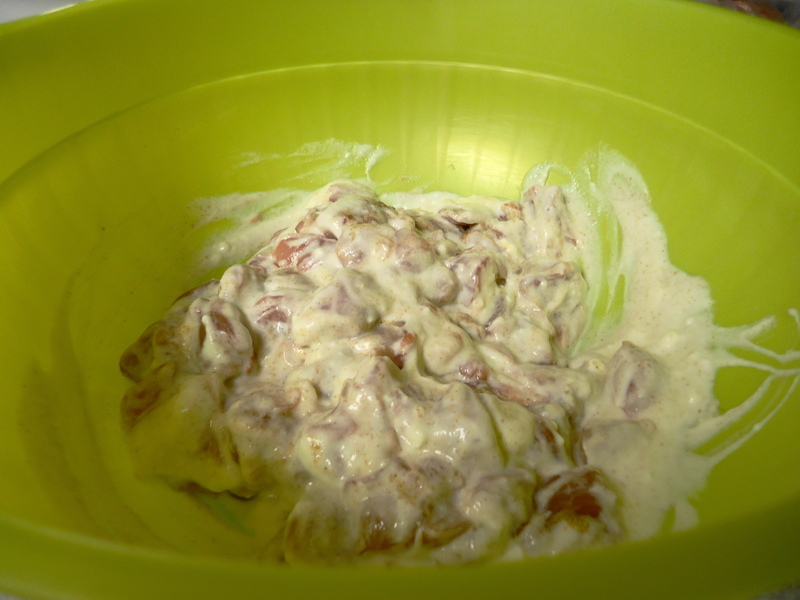 You will have left over bechamel sauce and can pop it in your freezer. 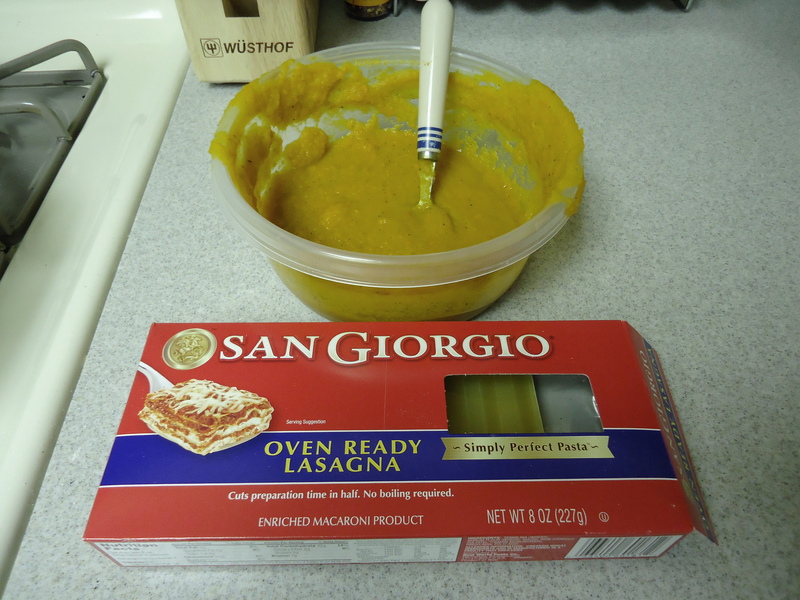 Now we are ready to start assembling our lasagna! Preheat your over to 350 degrees. 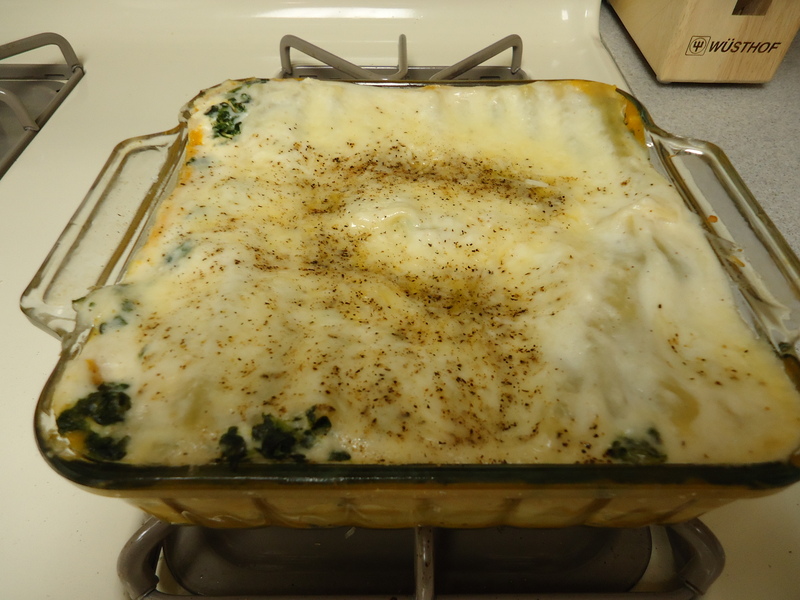 Pour half of the soup into a 9×9 baking dish. 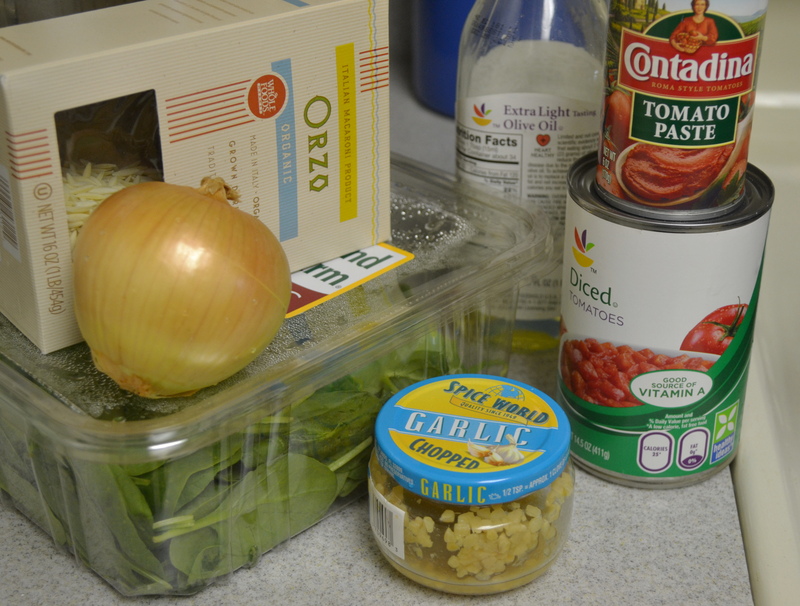 Lay 2-3 oven ready lasagna noodles on top of the soup and spread ricotta mixture and half your frozen spinach over noodles. Sprinkle half the shredded mozzarella cheese on top and then cover with half of your bechamel sauce. Season with salt & pepper, then lay 2-3 more lasagna noodles on top. Pour your final layer of soup over the noodles and cover with remaining ricotta and spinach mixture. Add the last layer of noodles and cover with remaining bechamel sauce. Sprinkle the rest of the shredded mozzarella cheese on top, and season with salt, pepper and garam masala. Cover with foil and bake for 30 minutes. I recommend using a little cooking spay on the foil to avoid loosing any cheese stuck on your foil. After 30 minutes, remove foil and put back in the over for another 5-10 minutes to lightly brown the cheese. Anyone hungry?! I’ve got plenty of lasagna to go around and am starting to turn orange due to all this squash!